What is a Single Line Diagram? A Single Line Diagram or a One Line Diagram is a simple way to draw the Electrical Circuit in a Power System. By adopting this Electrical Line Diagram the Complexity of the Pictorial Representation can be reduced. 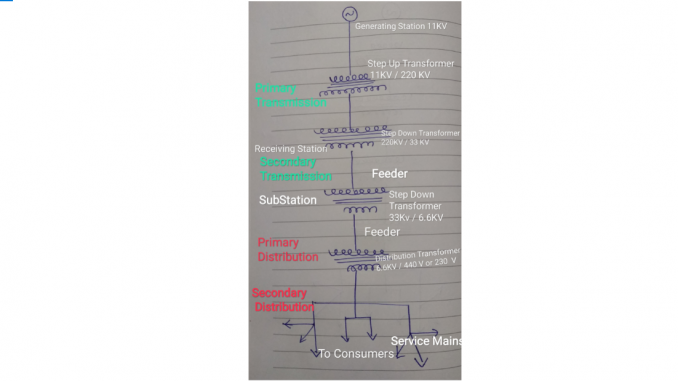 The Power Generated from the Generating Station is step Up using the Step-Up Transformer and then the Primary Transmission Takes Place. Step-Up Transformer is used to Minimise the Transmission Loss. 11Kv is Step Up to 220Kv before sending to Primary Transmission. In other Words, Primary Transmission is also called High Voltage Transmission since it deals with very high Voltage. At the Receiving Station, the voltage level is step-down from 220Kv to 33KV using Step-Down Transformer. Second Transmission System uses 3 phase system to Transmit Power to the various Sub-stations. In the Primary Distribution, a step-Down transformer (Usually called as Distribution Transformer) is used to reduce the Voltage to the desired Level. The Voltage is Step down from 33KV or 22Kv to 6.6Kv or 3.3Kv. Large Factories and Industries get power from Primary Distribution. Companies using Primary Distribution have their own Sub-station. It is also called High-Voltage Distribution. In Secondary Distribution, a Step-down transformer is again used to reduce the voltage level from 3.3 Kv to 440V or 230v. The End consumers get power through Secondary Distribution. 230V is used for Domestic Purposes. It is also called Low Voltage Distribution.